On September 19th, 2012 Monmouth Telecom released a Mozilla Firefox Add-On which enables Virtual PBX users to click any telephone number on a web page, and automatically dial that telephone number. This Add-On is completely free for users with Hosted PBX. Saves Time - You don't have to read the number from the screen and then dial it into the phone. Click Here to Download and install the Add-On from the Firefox Add-On Market. Click the yellow button "Add to Firefox" and then "Install Now." You need to be logged into the User Console of your Hosted PBX System*. If you are not already logged in, Click Here to go to the User Console and enter your username and password. This username should be of the form abc-123. If you do not know your username and password, contact your IT administrator, who can reset it for you. You are ready to Click-To-Dial! To test it out go to www.monmouth.com and click on the telephone number in the top right corner of the page. If everything is working your phone will ring and when you answer it, you will hear ringing followed by "Thank you for calling Monmouth Telecom..."
It is that easy! Any telephone number on any web page will be converted into a link. When you hover over the link, you will see the green telephone icon , telling you that you can click that phone number to dial it. 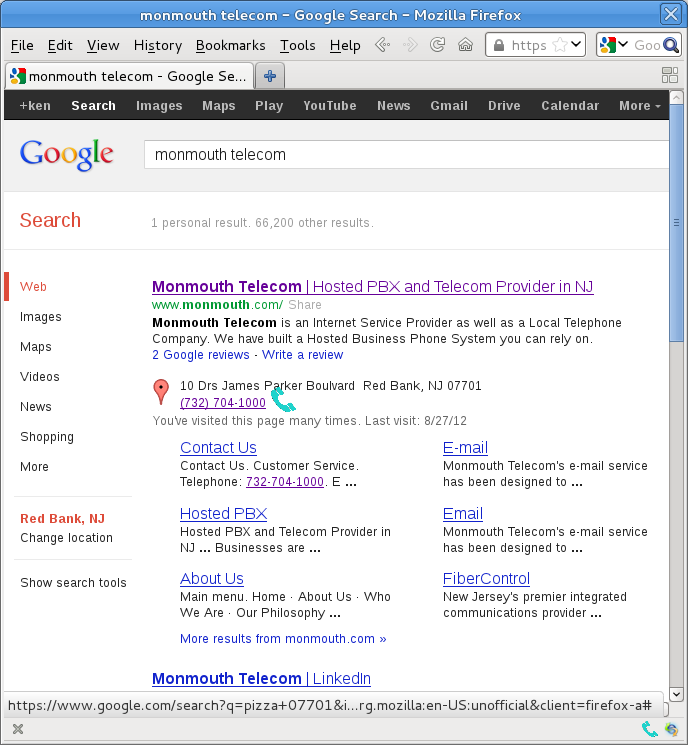 Here is a screenshot showing the Google Search Results for "Monmouth Telecom". In the center of the page there is a telephone number, which we can click on and dial. When you hover over a telephone number with your mouse, a small green telephone icon appears to let you know that you can click that phone number to dial it. Perhaps you have a report with many telephone numbers, and you do not want them to appear as links. Simply click the small green telephone icon on the "Add-On Bar" at the bottom of your Firefox Browsing Window. It will turn red , indicating it has been disabled. Any page you load after it has been disabled will not contain telephone numbers converted to Click-To-Dial links. If the "Add-On Bar" at the bottom of your Firefox Browsing Window is not displayed, you can display it by going to View -> Toolbars -> Add-On Bar. You must have permissions to see the Company Directory in the User Console to use this feature. All Users have this permission by default, but in the event that the feature is not working, this should be double-checked. If you do not have a "Directory" tab in your User Console, you need to ask your IT Manager to enable that permission for you. Firefox default privacy settings allow this Add-On to function properly. However, if you go to Firefox Preferences -> Privacy -> History and you select Use custom settings for history, and then you uncheck Accept third-party cookies, this will prevent the Add-On from functioning.